Home / IndyCar Series / This is Indy. This is May. This is Indy. This is May. Here is one way to explain the attraction of Indianapolis: nowhere else on earth is there a stadium or amphitheater with assigned paid seats for two hundred and fifty thousand people. Add a few more thousand to the infield and in truth you have four hundred thousand seekers crowding the edges of the 2.5 mile oval track in Speedway, Indiana. Bands march, celebrities gather from far and wide; as do the drivers. “Back home again in Indiana” has been sung, the prayer has been spoken, the anthem and “Taps” has been played. Honor has been paid to the fallen servicemen and women who have protect us from terror and despotism. Inside their cars the drivers feel trepidation, nervous for the first lap to come and go. 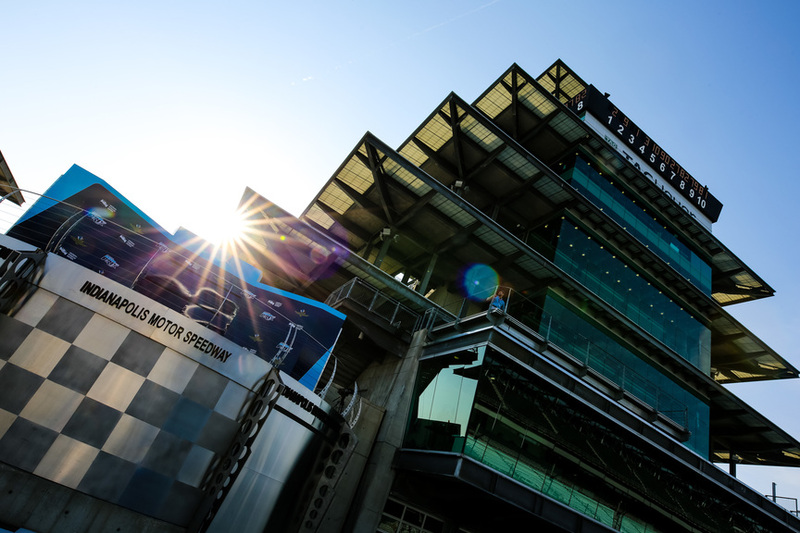 It is the time of the greatest tension at Indianapolis, just before the start as the balloons are released from their holding tent and rise into the Indiana sunshine. 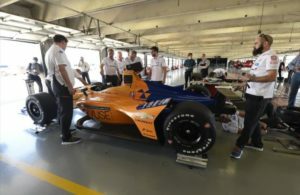 Everyone knows now it’s not far off–the most exciting moment in sport as the call “Drivers start your engines” blares over the public address and the engines growl to life, thirty-three strong, each snarling like a caged tiger ready to be loosed. There is an intoxicating scent of history, and tradition, and courage in the air at the Brickyard from the first time the cars take the track in practice. The track’s level of difficulty is so steep that rookies must pass a graded-speed driving test to go out on the track with their fellows. The oval and its speeds are intimidating in the same way a snorting, pawing bull intimidates the terrified lesser matador. It is mentally and physically exhausting, like a three-hour long boxing match against a champion opponent. There are tears shed at Indianapolis. Tears of joy for the winner, tears of sorrow for the loss of men here as they chased speed and fame over the asphalt and brick surface of the Indianapolis Motor Speedway. There are plenty of laughs and smiles, too, in the garages as brothers born of a single purpose and aim to win this race revel in their pranks and gags. The pressure is just incredible. The Indianapolis 500 can make or break a career. Without a victory here a driver cannot make true claim to the title of “Greatest of All Time.” Hundreds of thousands on the scene and millions around the world are watching. Thirty-three lonesome men in their cockpit and the wind whistling around their head and neck cruise around the track for two comparatively sedate laps before all hell breaks loose. The race isn’t won from the pole, nor on the first lap or in the first turn; but the angry charge into the initial narrow ninety-degree bend to the left is unnerving wherever you are in the melee. At two hundred-plus miles per hour a man (or woman) must be ready for a split-second decision that will determine his or her destiny. 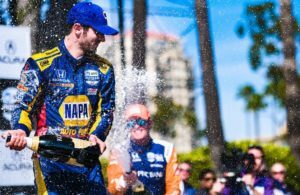 That’s the way it’s been for over a hundred years: the one who makes the right choice at a crucial moment will join the motorsports legends that haunt the grandstands of the world’s largest racing venue. But having said that, it’s a team sport too. The pit crew must operate as precisely and error-free as possible. The tire choices must be informed and correct; and the rubber must withstand the punishment administered at sustained speeds of 230 mph all afternoon long. And God forbid it happen, but the rescue and safety teams located around the track must be prepared for disaster and keenly alert every second of that afternoon. 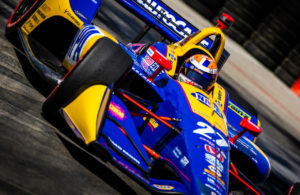 All over the world race drivers dream of having their name carved into the side of the giant silver Borg-Warner trophy that carries the likeness and names of those who have won at Indianapolis. There is no prize anywhere in sport as grand as winning the Indy 500; it’s the pot of gold at the end of the racing rainbow.